In the beautiful Shoalhaven district, about 2.5 hours south of Sydney, Australia, Margaret Burke lives with her husband of almost 29 years, one of their two daughters, Nikki, and two neurotic cats, Lily and Mia. Margaret grew up in the sprawling western suburbs of Sydney as the eldest of 4 children in a working-class family, and lived most of her life in Sydney; only moving with her husband and children to the Shoalhaven district 10 years ago for a more relaxed lifestyle and to be close to the ocean. "My family are keen anglers and for many years we have enjoyed sports fishing. Since our girls have grown up, it’s really only my husband who fishes regularly as I have now discovered the joys of bear making and spend most of my spare time creating!" Margaret chanced upon bear making while at a Stitches & Craft Show in Sydney one day with her friend who makes porcelain dolls. "I was attracted to some of the bears made up from the kits being sold." "Unfortunately, the kit I wanted had sold out, but my interest was piqued enough to look around for others. 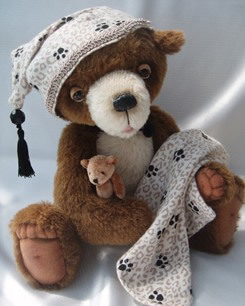 I made my first bear early in 2007 from a department store kit, and then progressed to making bears from other bear artist’s patterns before attempting my first original pattern in mid 2007." Most of her bears are made from natural colors and denser furs. "I absolutely adore the plush, dense pile of alpaca particularly. I have just discovered Japanese silky mohair with its luxurious, soft texture. I don’t have any particular favorite colors for the furs I choose, preferring to add color through accessories." As she hasn’t attended any bear artist workshops, Margaret has learned all of her bear making skills through books, magazines, internet forums and from entering critiqued competions. "I am a member of Teddy Bears and Critters Australasia, Teddy Bear Society, Guild of Master Bearcrafters and Teddy Talk; all of which have wonderful online forums and plenty of help and advice from bear artists all over the world." "I like to trade at the Sydney Teddy Bear Fair, Mittagong Doll & Bear Show, Central Coast Doll & Bear Show and Newcastle Doll & Bear Show each year. They are all within a comfortable day’s drive from my home, and I have just started trading at periodic online shows through the Teddy Bears & Critters Australasia website." 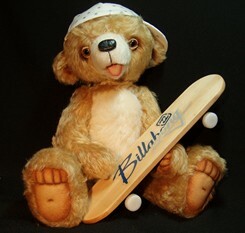 "I won my first competition in May 2007 at the Sydney Teddy Bear Fair where I won Best Novice Bear which encouraged me to keep entering competitions. I do so mostly to learn from judges comments in critiqued competitions and to improve my techniques in doing so." In 2008, she won the Best Open Bear at the South Australian Teddy Bear Show, and has been a finalist in the People’s Choice of the Sydney Teddy Bear Fair in 2008 and 2009. "Most recently, I have won the Best Photographic Layout in the 2009 Spring Challenge show conducted by Teddy Bears and Critters Australasia." As a relative newcomer to the bear making industry, Margaret feels that she is still developing her ‘signature style’ although she does get quite a few positive comments at shows and elsewhere on her bear's eyes and little round bottoms. "I work painstakingly to create character and personality in each of my bears and feel that I achieve this through striking starburst, hand-painted eyes." Margaret draws inspiration from some unusual sources. "I love the color and fantasy of shows such as Cirque du Soleil and Fanta-Sea in Phuket, Thailand." She finds herself drawn to artists whose styles are more fantasy based and contemporary. Her company, Nikkel Bears, was only created in July 2008, the name comes from the combination of her daughter’s names: Nikki and Kelly. Margaret hand stitches all of her bears (yes, even the larger ones!) and has recently started creating trapunto toes in different styles which she is really enjoying. "I actually have done the opposite of a lot of other bear artists, starting out creating smaller bears at 6 inches, working up to 9 inches and now to 16 inches which is my current favorite size. I have just completed Cozzie, my biggest hand-stitched bear to date which is a whopper at 19 inches!" Margaret works full time as a manager in a busy chemical manufacturing plant. "During the week however, I can’t manage without my daylight lamp, as most of my work is done at night time." All this has limited her creative time, but she still manages to make around 15-20 bears per year. "I love the quiet time spent creating new bears, as it allows me to escape from the grind of everyday working life. I love nothing better than sitting outside on weekends to sew after being cooped up in an office all week!" With her web site now running, one of her New Year’s Resolutions for 2010 is to find the time to keep it not only updated but to learn new computer skills too. In her spare time, Margaret happily enjoys time spend with her 2 year old grandchild, Mikaela. And in June 2010 she'll be welcoming another special creation, this one created by her daughter, Kelly, who will make her Margaret and her husband grandparents a second time in June. And what makes the perfect baby gift? A teddy bears, of course!